Aera Earth-Turner is a Nord farmer on Bleakrock Isle. After the Covenant attack, she evacuates with her husband, Denskar, son and daughter to Bal Foyen. As the Covenant's attack expands to the mainland, you will need to decide between defending Fort Zeren or the Bal Foyen docks. Since Littrek and Denskar are located at the fort, and Tryn at the docks, Aera is bound to lose a family member to the attacking Covenant army, which is an experience that substantially hardens her. Later, she can be found in Shor's Stone where she is tracking a Clan Matron of the Reach. She asks you to kill the matron and all her followers for the side quest The Troubleshooter. You learn that Aera has joined the Ebonheart Pact, sworn revenge on the Covenant and has been killing their soldiers. She says, "the Pact has given me purpose, a reason to live beyond Bleakrock." If you choose to ask her how she is doing, she will say she is "well enough" and that "it's easy to wallow in the thoughts of Bleakrock. Of the good days." She reveals that she had a breakdown after Bal Foyen. She lost family, and the other survivors from Bleakrock kept reminding her of "everything she lost." She is a good tracker. Aera Earth-Turner keeps a book in Shor's Stone of all the Worm Cultists she has "brought to justice." All of them died during the arrest or soon after. During your adventures in Nimalten you will find out that Aera serves as a sergeant and is investigating the recent Worm Cult attacks against Thane Fjora. It is soon revealed that Aera is involved with the cult: she had made a pact with them, promising to kill the thane and her court mage in exchange of being able to see her dead family members again. When you track down Aera and confront her inside Nimalten Barrow you have a choice to either kill her, arrest her or let her go. If you kill her, you'll encounter her again in the Heart's Grief Vestibule. "That daughter of mine. You mark my words- she'll never amount to anything." "She spends all day with that blacksmith. She wants to move to the mainland and spend her life at a forge. That nice fisherman Otroggar has been trying to woo her for months. She won't even listen to him." After the Covenant sets fire to Bleakrock Village, Aera will be taking shelter in Tillrani Snowbourne's House. "The soldiers are everywhere! Where's Tillrani? I thought I'd be safe with her!" Tillrani's not here. Hurry! Run to the tomb. "I'll bet she's there now. I'll see her there. Thank you!" "I loved Tillrani, I really did, but I'm not going to let Trynhild run out of here lusting for revenge." "I don't know what I'm going to do. Trynhild wants to run off and join the war. Littrek already has a sword. My home, my family... what else can they take from me?" Aera Earth-Turner: "Hurry, friend. Bal Foyen is under attack!" Everyone. They're all gone. My family is gone." Where have they gone, Aera? And they're outnumbered. I fear everyone we know will be dead before the day is out." "Damn the Covenant. My family was happy. Well, maybe not happy. But they were content." Aera, tell me what happened. "The Covenant attacked in force when they saw the signal fires. Even now, they're marching on Fort Zeren. Darj took some of the villagers there, including my men." Should I go to the fort? I'm afraid you must choose." I understand. I have to choose between the docks and the fort. "I know it's a hard choice, but you must go to the fort or the docks." Aera, can you help me decide? "I don't know. Maybe I can help you talk it out. Won't the fort walls protect the refugees? "I want to think so. I really do. But the Bretons are known for their magic. If they could find a way through or around those walls ...."
"I trust you. You've already saved us once. If you decide to go to Rana's aid, I know it will be the right call. I know Darj will win the day." Can't Rana defend the docks without me? "Captain Rana knows her business. And she has capable people with her, including my daughter. But the docks have no walls, no defensive positions." You let your daughter go with Rana? "I did. Trynhild is proud and stubborn, like her mother used to be." Why hasn't the Covenant attacked Dhalmora? "No idea. Perhaps their generals don't see a mud-brick village as a threat. I wish they'd felt the same way about Bleakrock." "Glad to see you. I came to be with my men. The Daggers almost had us. Go. Darj has need of you." "He went to the keep. Said something about a "master portal" opening at its heart. A Covenant general is coming through." "We... we won! We're still alive! I can't wait to see Trynhild again. I have so much to tell her." From this point on, you will encounter Aera at various locations throughout Stonefalls with the remaining Bleakrock veterans..
Aera will be mourning the loss of whichever of her family members died as a result of your choices after Crossroads. "<Aera doesn't look up. 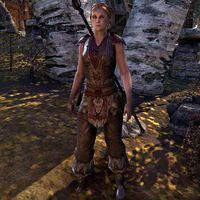 Tears stream down her face as she quietly sobs.>"
Aera can be found camping with the remaining Bleakrock refugees just outside the city of Ebonheart, east of where the Nord wood sellers are located. She is sitting further away while her husband and son spar nearby. "My men insist that Tryn's death wasn't in vain, that she gave her life in defense of the powerless. The Pact is stronger, but my heart is weaker. My Tryn ...."
If Trynhild is dead, you can find her sleeping beneath a tree as Rexus watches over her. She is located east of the Kragenmoor Wayshrine, behind the Vanguard Captain who is berating his soldiers. This page was last modified on 9 March 2019, at 03:30.